I think we can all agree that concurrency is a problem. Not really a problem as in “lets get rid of it”, but more the type of problem that really smart people spend their entire lives trying to solve. Over the years, many different solutions have been proposed, some of them low-level, some more abstract. However, despite their differences, a common thread runs through all of these ideas: each of them attempts to ease the pain of decomposing operations in a reorderable fashion. Surprisingly, the word “ordering” is not often heard in conjunction with parallelism. Most of the time, people are thinking in terms of server/client or broker/investor. If you really deconstruct the issue though, there is actually a deeper question underlying all concurrency: what operations do not depend upon each other in a sequential fashion? As soon as we identify these critical operations, we’re one step closer to being able to effectively optimize a particular algorithm with respect to asynchronous processing. By the way, I really will get to fork/join a little later, but I wanted to be sure that I had laid a solid groundwork for the road ahead. Without understanding some of the fundamental theory behind fork/join, it will be impossible to see how it can be applied effectively to your next project. All this may seem extremely pedantic but please, bear with me. Consider these operations very carefully in the topological sense. What we’re trying to see here is if one (or more) of these operations may be ordered above (or below) one of the others. For example, could we perhaps dispatch to fac after multiplying and returning? Or could we perform the subtraction operation after the dispatch? The answer is quite obviously “of course not”. There is no way we can change the ordering in this expression because each step depends entirely upon the result from the previous. As far as our attempts to parallelize are concerned, these three operations are completely atomic, meaning that they form an inseparable computation. Since we’ve drilled down as far as we can possibly go in our implementation and so identified the most atomic computation, let’s move out one step and see if we can find anything with promise. Stepping back through our execution sequence leads us directly to the branching operation identified previously. Remember that our goal is to identify operations which can be shuffled around in the execution order without affecting the semantics. (does this feel like pipeline optimization to anyone else?) Unfortunately, here too we are at an impasse. We might try moving an atomic computation from one of the branches out before the branching operation, but then we could conceivably do the wrong thing. Since our function uses recursion, this sort of reordering would be very dangerous indeed. The truth is that for factorial, there are absolutely no operations which can be moved around without something going wrong. Because of this property, we are forced to conclude that the entire factorial operation is atomic, not just its false branch. Unfortunately, this means that there is no way to effectively transform this function into some sort of asynchronous variant. That’s not to say that you couldn’t calculate factorial of two separate numbers concurrently, but there is no way to modify this implementation of the factorial function in a parallel fashion1. This is truly the defining factor of atomic computations: it may be possible to reorder a series of atomic computations, but such a reordering cannot affect the internals of these computations. Within the “atom”, the order is fixed. So what does reordering have to do with concurrency? Everything, as it turns out. In order to implement an asynchronous algorithm, it is necessary to identify the parts of the algorithm which can be executed in parallel. In order for one computation to be executed concurrently with another, neither must rely upon the other being at any particular stage in its evaluation. That is to say, in order to execute computation A at the same time as computation B, the ordering of these two computations must be irrelevant. Providing that both computations complete prior to some computation C (which presumably depends upon the results of A and B), the aggregate semantics of the algorithm should remain unaffected. You could prove this, but I really don’t feel like it and frankly, I don’t think anyone reading this will care. Now that we have some simple analysis on factorial under our belt, let’s try something a little tougher. The Fibonacci series is another of those classic computer science examples. Curiously enough, the implementation used by every known textbook to explain recursion is actually one of the worst possible ways to implement the calculation. Wikipedia has an excellent description of why this is, but suffice it to say that the intuitive approach is very, very bad (efficiency wise). Like factorial, this function makes an excellent poster child for the syntactic wonders of functional programming. Despite its big-O properties, one cannot help but stop and appreciate the concise beauty of this single line of code. Ah, this looks promising! We have two “blocks” of operations which look almost identical. Printed redundancy should always be a red flag to developers, regardless of the form. Printed redundancy should always be a red flag to developers, regardless of the form. In this case though, we don’t want to extract the duplicate functionality into a separate function, that would be absurd. Rather, we need to observe something about these two operations, specifically: they do not depend on one-another. It doesn’t matter whether or not we have already computed the value of fib(n - 1), we can still go ahead and compute fib(n - 2) and the result will be exactly the same. We’re going to get into trouble again as soon as we get to the addition operation, but as long as both dispatches occur before the final aggregation of results, we should be in the clear! Because it does not matter in which order these computations occur, we are able to safely parallelize without fear of subtle semantic errors cropping up at unexpected (and of course, unrepeatable) full-board demonstrations. Armed with the assurance which only comes from heady, unrealistic trivial algorithm analysis, we can start planning our attack. I can’t even begin to count all of the things that are wrong with this code. For starters, it’s ugly. Gone is that attractive one-liner that compelled us to pause and marvel. In its place we have a 25 line monster with no apparent virtues. The intent of the algorithm has been completely obscured, lost in a maze of ceremony. But the worst flaw of all is the fact that this design will actually require (n – 2)! threads. So to calculate the 10th Fibonacci number, we will need to create, start and destroy 40,320 Thread instances! That is a truly frightening value. At first blush, it seems that we can alleviate at least some of the insanity by using a thread pool. After all, can’t we just reuse some of these threads rather than throwing them away each time? Unfortunately, this well-intentioned approach doesn’t quite suffice. It turns out that we can’t really pool very many threads due to the fact that we’re utilizing a thread in fib to recursively call itself and then wait for the result. Thus, the “parent” dispatch is still holding a resource when the “child” attempts to obtain an allocation. Granted, we have reduced the number of required threads to a mere 2n – 4, but with a fixed size thread pool (the most common configuration), we’re still going to run into starvation almost immediately. Apocalisp has a more in-depth article explaining why this is the case. For the moment, it looks like we have run into an insurmountable obstacle. Rather than mash our brains out trying to come up with a solution, let’s move on and conceptualize how we might want things to work, at least in syntax. I’m assuming that a variable called exec is defined within the enclosing scope and is of type ExecutorService. The helper method is just syntax, the real essence of the example is what we’re doing with Future. You’ll notice that this is much shorter than our threaded version. It still bears a passing resemblance to that horrific creature of yesteryear, but yet remains far enough removed as to be legible. We still have our issue of thread starvation to content with, but at least the syntax is getting better. Along those lines, we should begin to notice a pattern emerging from the chaos: in both implementations so far we have started by asynchronously computing two values which are assigned to their respective variables, we then block and then merge the result via addition. Do you see the commonality? We start by forking our reorderable computations and finish by joining the results according to some function. This right here is the very essence of fork/join. If you understand this one concept, then everything else falls into place. Now that we have identified a common pattern, we can work to make it more syntactically palatable. If indeed fork/join is all about merging asynchronous computations based on a given function, then we can invent a bit of syntax sugar which should make the Fibonacci function more concise and more readable. To differentiate ourselves from Future, we will call our result “Promise” (catchy, ain’t it?). The only reason to use an anonymous method assigned to a value (add) rather than a first-class method is the Scala compiler treats the two differently in subtle ways. Technically, I could use a method and arrive at the same semantic outcome, but we would need a little more syntax to make it happen (specifically, an underscore). Incidentally, the =<< operator was not chosen arbitrarily, its resemblance to the “bind” operator in Haskell is quite intentional. That is not to say that the operation itself is monadic in any sense of the word, but it does bear a conceptual relation to the idea of “binding multiple operations together”. The operator is inverted because the bind operation is effectively happening in reverse. Rather than starting with a monad value and then successively binding with other monads and finally mapping on the tail value (as Scala does it), we are starting with the map function and then working our way “backwards” from the tail to the head (as it were). None of the monadic laws apply, but this particular concurrency abstraction should tickle the same region of your brain. Rather than stopping the world (or at least, our little thread) while we wait for a sub-operation to complete, we just tell it to give us the result as soon as it’s done and we move on. The whole thing is based around the idea of asynchronous message passing. The first person to say “actors” gets a gold star. Every Promise is an actor, capable of evaluating its calculation and sending the result wherever we need it. The =<< builds up a "partially-applied asynchronous function" based on the original function value we specified (add), binding each Promise in turn to a successive argument (a nice side-benefit of this is compile-time type checking for argument binding). Once the final argument is bound, a full-fledged Promise emerges with the ability to receive result messages from the argument Promise(s). Once every value is available, the results are aggregated in a single collection and then passed in order to the function. The final result is returned and subsequently passed back to any pending actors. It's a classic actor pattern actually: don't block, just tell someone else to call you as soon as they are ready. With this strategy, it is actually possible to execute the whole shebang in a single thread! This is because we never actually need to be executing anything in parallel, everything is based on the queuing of messages. Of course, a single-threaded execution model would completely ruin the entire exercise, so we will just trust that Scala's actor library will choose the correct size for its internal thread pool and distribute tasks accordingly. For the mathematically challenged, the results show that the parallel execution using Promise was 95.351698% faster than the same operation run sequentially. That's almost linear with the number of cores! Accounting for the overhead imposed by actors, I would expect that the impact on performance would approach linearity as the number of cores increases. Fork/join isn't the answer to the worlds concurrency problems, but it certainly is a step in the right direction. Also, it's hardly a new approach, but it has generally remained shrouded in a murky cloud of academic trappings and formalisms. As time progresses and our industry-wide quest for better concurrency becomes all the more urgent, I hope that we will begin to see more experimentation into improving the outward appearance of this powerful design pattern. Nice writing, as always. Maybe you’d like to send this to Cliff Click? He’s looking for some code he can benchmark on the Azul JVM, which he’ll then analyze and report on. See his blog entry, http://blogs.azulsystems.com/cliff/2008/09/a-plea-for-prog.html. Would be fun to see how well this scales to a large number of cores. Bear in mind that the Promise in this article is different from the one provided by Functional Java. They behave similarly, but mine is very much a separate class. It has no bind, map or join functions (though it does have unit). You could write such functions for it, but they wouldn’t be very useful since monads are single threaded. If you attempt to bind two Promise(s) together, the first *must* be executed before the second. Binding forces an order of evaluation, thus preventing potentially independent operations from being arbitrarily reordered (as would be required for concurrency). This actually makes sense when you consider how monads are used for IO in Haskell. I am the mathematically-challenged. I read the sequential row taking 15k ms and the parallel 7.5k ms. How is that a 95% improvement? I’ll repost the previous comment here in a bit, but I’ll say that the notion “monads are single threaded” is a misconception. Yes, binding imposes a sequence, but that doesn’t preclude concurrency because monads are also applicative functors which are inherently parallel. This is what lets you create your “binary bind”. If x and y are promises, then what x.bind(y, z) says is: start evaluating y, then start evaluating z, then apply the promise-valued function x to those. Your Promise class is a monad, because you have both bind and unit functions, even though your bind is flipped. It also has join and map functions, even if you haven’t written them. The hypothesis that there exists such functions still holds. I’m not sure if that’s how the identity is *supposed* to work, but that’s what would happen with =<< the way I have defined it. The function in question does not return a Promise. Likewise, the associativity law does not hold, since g =<< f(x) is not valid unless f returns of type Promise[T], but in that case the left-hand side of the associativity breaks down. As cool as it would be to use comprehensions to compose concurrent operations, it just doesn’t work. A “binary bind” (as you called it) is required to allow arbitrary ordering. Even then, I would argue that binary bind is insufficient for truly efficient concurrency, since you would effectively generate a multi-level tree for operations which require more than two compositions. This reduces the efficiency of the queuing by forcing an implicit priority of some operations over the others. Ordering may still be arbitrary, but the bound trees must be kept together. I haven’t had a chance to read the paper you linked, so it’s quite possible that all this is addressed, but I should think that instead of limiting operations to a binary bind, the concept should be generalized to “n-ary” terms. Effectively, this is what I have done, though I wasn’t thinking along those lines when it happened. Daniel: My mistake. What you have written, in Haskell terms, is not (=<<) at all, but the <*> operator from Control.Applicative, or an approximation thereof. But I’ll bet you could write the bind operator proper and make this fully a monad. The one I wrote (in Java of all things) is a monad and it does work. It’s not entirely correct that you would have to generate a “multi-level tree” like you say, because of the monadic join operator. Monadic join is the essence of Promise. That’s what makes it non-blocking. I.e. you can map a promise-valued function over another and this will yield a Promise of a Promise. That would require two threads to compute if it weren’t for monadic join which turns that into just a Promise. That is why you can run the Fibonacci example in one thread. The “binary bind” (or “ap”, or “apply”) is indeed sufficient. You can imagine mapping the unit function over a List[A], which will give you a List[Promise[A]]. The order in which those promises are evaluated is obviously arbitrary as you have said. Further, because of the existence of “ap” (equivalent to your “bind”), you can distribute List over Promise and get a Promise[List[A]]. 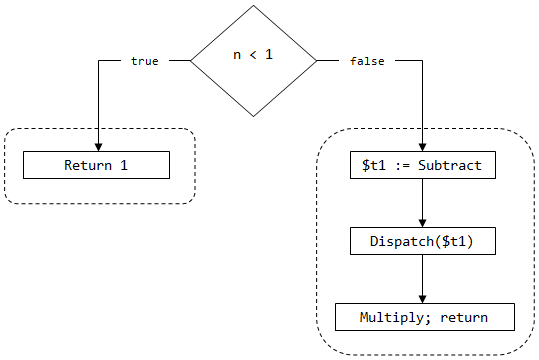 See fj.control.parallel.Promise.sequence for an example. The combination of these operators (map, then sequence) is called mapM in Haskell. Another brilliant article Daniel. In the example that uses Futures I think the last line of fib needs to be wrapped in a Future for the code to compile. Nice catch! I’ve corrected the code snippet. I still don’t see how the “map a promise-valued function over another” can be concurrent. In order for map to work the way I understand it, the value must be extracted from the target Promise before the map function can even be invoked. Because of this requirement, the order of evaluation is enforced and concurrency is impossible. I think the problem is that my grasp of monads is too narrow. For example, in your article, you referenced bind of the form bind(Promise[A], Promise[B], (A, B)=>C): Promise[C]. To my understanding, that’s not a monadic bind, it’s something else entirely. It’s certainly a useful function in conjunction with datatypes which are obviously monadic in nature, but I guess I don’t see it as part of the monad definition per se. Seems I still have much to learn! Looking at the type signatures, my =<< really does look a lot like liftM_ (where _ is replaced by ” through 5). I’ll have to look around to see some samples of how liftM is generally applied. Seems that my extremely weak Haskell skills are going to get a refresher in the next few days. It isn’t really, but the point there is that you don’t need to construct a hierarchy of promises. Because of monadic join, what you end up with is a single actor waiting for a value to which to apply the composed function. The “bind” method that I’m referencing in my article is equivalent to liftM2 also. It’s a composition of apply and map, and apply is in turn just a composition of bind and map. Have fun brushing up on your Haskell. Perhaps I misunderstand what you mean by “there is no way to modify the implementation of the factorial function in a parallel fashion”, but… to work out 9!, why can’t I (on my 3 processors) work out 1*2*3, 4*5*6, and 7*8*9 in parallel, then multiply the results together? At first glance, it seems like this is the same as your suggested implementation. However, we have introduced a very subtle problem here: overlapping sub-problems. Think about it, fac(n) requires fac(n – 1) and fac(n – 2). Moving on, fac(n – 1) requires fac(n – 2) and fac(n – 3). This naive implementation has increased the computational complexity from O(n) to O(n!). Aside from the neatly-recursive nature of that expression, we’ve created a mess. In order to make the “piecemeal factorial” work, we either need to memoize the results (dynamic programming), or we need to try a different approach. Specifically, we could start from the bottom and work our way upwards to n. Unfortunately, this implementation would not be naturally recursive and thus, a little bit less subjectively elegant. So unwinding that nice, long rabbit trail: yes, you’re correct, factorial *can* be computed in parallel. However, it can be very difficult to explain that in short, comprehensible examples without leading to a distracting tangent like the above. 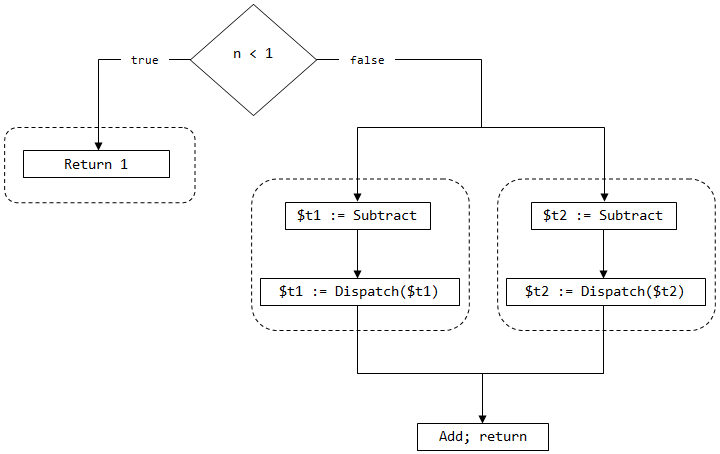 Besides, it was sort of nice and simple to explain operation reordering just using fac and fib, two functions that everyone understands intuitively. On second thought, I’m a howling jay. The function I gave in my comment does *not* compute factorial, it does something else entirely. My point remains though: a compartmentalized factorial as Jonathan described cannot be written as nicely recursively as the canonical implementation. Not sure if you’re familiar with it, but the E language has a version of Futures called Promises as well. thx for the step-by-step intro to the fork/join principle. Like Jonathan, I think your choice of functions is a little bit misleading. Factorial is perfectly parallelizable by using the right algorithm. (You said that would require an ‘entirely different approach’, but isn’t using fork/join a different approach, as well?) . Admittedly the resulting definition of factorial is not as nice as your simple mathematical definition. The fibonacci function however is in a very deep sense not parallelizable, since the last result depends on every single result before. Looking at the whole tree of computations your algorithm does, you can see that you call fib O(n!) times. Than you cut that in half by using two threads. You noted yourself that there are better algorithms: ‘Also, they’re fairly efficient in their own rights and thus see far less benefit from parallelization at the end of the day.’. That’s right, because you can’t reasonably make it parallel. Don’t take me wrong, I know the purpose of this post was to explain fork/join but it leaves a thought of premature optimization to me. All true (well, see next paragraph). The trouble is that algorithms which are intuitively parallelizable do not grow on trees. Worse, they tend to be a little more complicated than a simple factorial and fibonacci. I could have used them, but to do so would have detracted from the main point and made the final result a little less convincing. 14.6 vs 7.5 seconds is a pretty impressive comparison, and while the ratio would have been the same with a O(n) fibonacci, the difference would not have been so dramatic. I actually disagree with you that the naive implementation of Fibonacci is not parallelizable. The fact that each calculation depends on two previous ones does not necessarily obviate the possibility, as shown by the fact that I did it. Doug Lea himself in explaining fork/join used pseudo-code algorithms which are assumed to be recursive in this fashion, despite the fact that they would share the same “unparallelizable” characteristics. I think what you are seeing in Fibonacci is the issue of blocking recursion, each computation requiring its precedents and blocking until they are available. This is the problem which is solved by using actors in a linear chain. Each computation completes and then passes the result *specifically* to another Promise. Essentially, the actor strategy used transforms the Fibonacci computation from top-down to bottom-up. It’s still O(n! ), but it no longer requires blocking on results which aren’t there yet. I didn’t go into this too deeply, but Apocalisp made it the main focus of his article. I refer you to his superior explanations. I am not sure if one can really say that fork-join “has generally remained shrouded in a murky cloud of academic trappings and formalisms”, but if so it will surely change once JDK7 is released since it should include Doug Lea’s fork-join library. The source code is in CVS and from my experiments it works great. There is also a version that uses BGGA closures. Now fac(n) is recursively broken into independent subtasks, and should be an ideal candidate for fork join. For optimal performance it should fall back to sequential computation earlier than (to – from == 1). ‹ Implicit Conversions: More Powerful than Dynamic Typing?